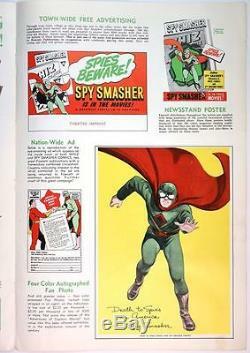 This is an absolutely wonderful original paper poster promoting both Spy Smasher Whiz Comic books & Spy Smasher Republic serial movies. 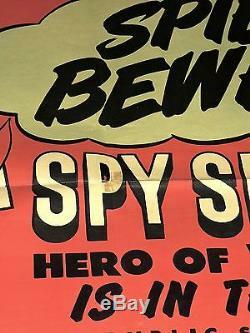 This was a special promotional poster & is featured in the original Spy Smasher pressbook. We are showing a part of the original pressbook. PLEASE NOTE - the pressbook is NOT a part of this listing. 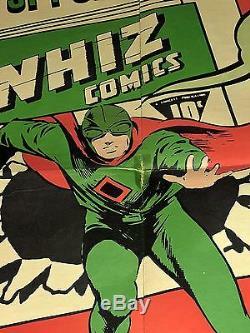 The poster offers a fabulous image of Spy Smasher flying off the cover of a Whiz comic book. 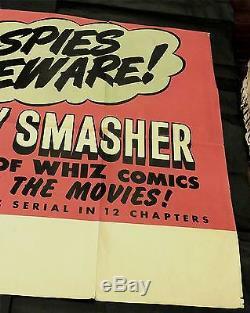 Whiz comics & the movie serials are mentioned. There is blank space at the bottom in which theatre info could be listed. There is some overall wear/damage that includes. 3 pieces of old tape on the back of the horiz fold line that has bled thru to the front - on his body, on the P of Spy & onto 2nd S of Smasher. Some small fold line tears. Mild crease line from the left edge into the Spy Smasher - doesn't deter. Wonderful comic book & movie tie-in poster! 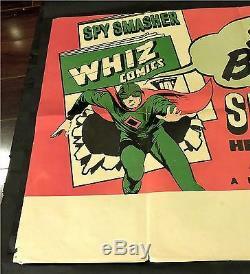 The item "SPY SMASHER SERIAL WHIZ COMIC BOOKS ORIGINAL ULTRA RARE SPECIAL POSTER 1942" is in sale since Wednesday, March 29, 2017. This item is in the category "Collectibles\Comics\Golden Age (1938-55)\Superhero". The seller is "lazarson3" and is located in nj.